Having spent the last decade searching out the best wildlife spectacles the planet has to offer, I thought I’d seen it all. 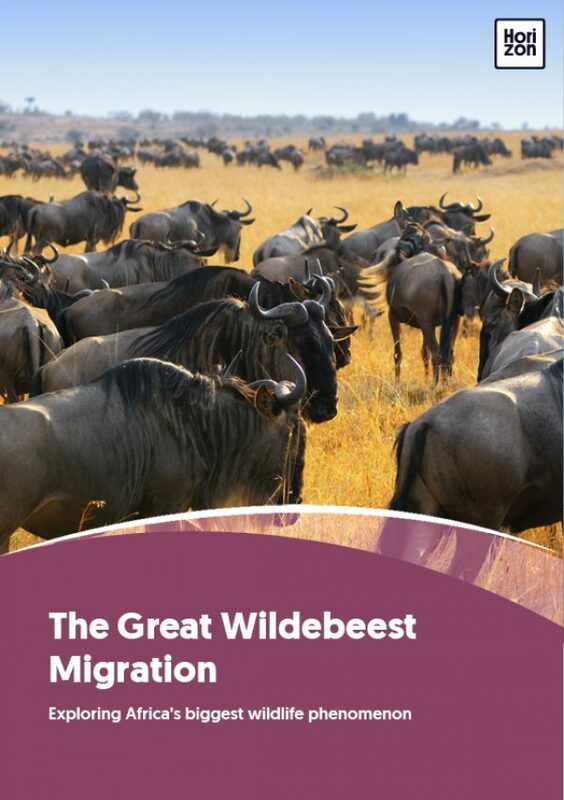 But nothing could prepare me for the first time I laid eyes upon East Africa’s Great Wildebeest Migration. It was in the Serengeti, in north-western Tanzania, and the massed ranks of wildebeest, more than a million strong, streamed across the horizon. Wildebeest blarts echoed to the horizon and incessant hoofbeats pounded the taut skin of Africa, an earth rhythm of biblical proportions that survives nowhere else but here. In the wildebeest’s midst, perspective-altering zebra stripes shimmied through the heat haze while golden-hued gazelles stepped daintily through golden grasses. Watching the sheer scope of what passed before me evoked a feeling akin to vertigo. In time I came to understand that there is so much more to the migration than its scale, epic though it may be. In these times when news from the natural world is all too rarely uplifting, the simplicity of the migration’s mechanics is a strangely reassuring event to experience. Few scientists may credit the wildebeest – this strange creature with its spare-parts appearance, fly-blown beard and crazy-legged movements – with nature’s highest IQ, but they somehow know when the time to move has come. Rains that fall hundreds of miles away spark in the wildebeest and their companions some ancient wisdom that tells them it is time for them to move. And so they set off in search of greener pastures, of new-growth grasses that sustain their herds just as they always have. There are good years and bad, it is true. But this millennial pattern, like the wildebeest, marches on, an enduring link between old Africa and the new. And whether it takes place on the vast, hallucinatory plains of the southern Serengeti or Kenya’s Masai Mara – the two bookends to this relentless movement of creatures – or in the crocodile-filled depths of the Grumeti River, there is drama at every turn. In the shadows of the herds and in the shallows of their river crossings, predators stalk their prey in Africa’s eternal dance, in that endless struggle for survival. Crocodiles gorge themselves on their annual feast. Lion prides watch for the weakest links, and then work as a team to feed their young. Cheetahs accelerate across the plains, the epitome of feline grace. Leopard lurk in the shadows, patient, the very manifestation of stealth. These battles for life and death are monumental and yet barely slow the advance of wildebeest armies that move stubbornly on at the behest of the rains and the grasses these rains produce. It occurred to me back then as I watched the migration for the very first time, that this could just be the greatest show on earth. Here was – and still is – one of the few places where wild animals roam free and in such numbers. And it remains a reminder that Africa is still the planet’s last refuge for the natural world’s great herds of wild creatures and for the wild places they inhabit.